What is the genesig q16? 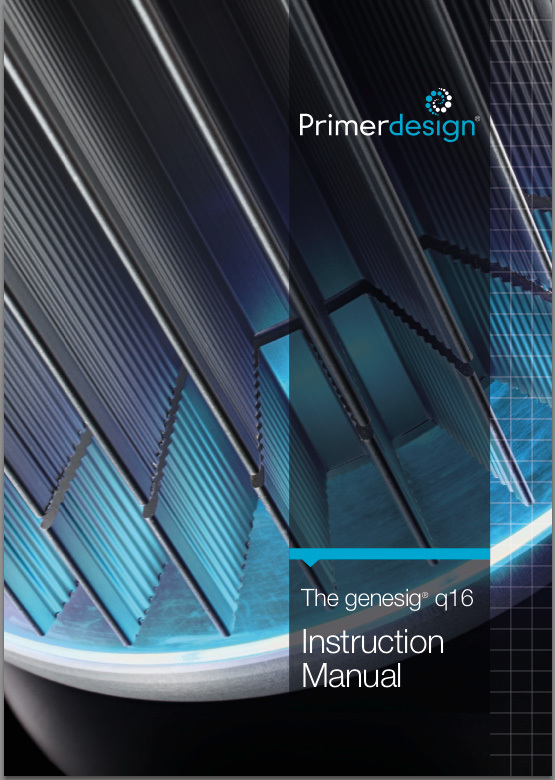 The genesig q16 is a revolutionary instrument launched by Primerdesign Ltd. The instrument is designed to accompany the genesig Easy product range which includes kits for more than 550 different DNA testing applications. The genesig q16 is designed to make DNA testing affordable and easy for anyone in any business. DNA testing is the most sensitive and precise way to detect and quantify the presence of a DNA target. The underlying technology within the genesig q16 is real-time quantitative PCR. The technology has been around for 20 years, but to date has been complex and expensive to perform. The genesig q16 changes all that. I don't have laboratory. Can I use it? Yes! If you don't have a laboratory it really doesn't matter. The instrument is designed to be used by anyone, anywhere. There is no complex programming or data analysis required. All of that is taken care of by some clever software. All you get is the answers to the questions you ask. Alongside the instrument we can also supply you a complete 'lab-in-a-box' containing the few simple tools that you need to do your own DNA testing. No. You will need to follow some very simple steps to extract the DNA from your sample. Then put it in to a tube and on to the genesig q16. It's easy. And we'll provide incredibly simple instructions to guide you through your first experience. What are genesig Easy Kits? genesig is a catalogue of over 550 different DNA and RNA testing kits for a wide range of applications. The kits come in 3 formats: Easy, Advanced, and Standard. The genesig Easy Kit range is the easiest to use version and is designed specifically and optimised for use on the genesig q16 instrument. What is in a genesig®Easy kit? The kit contains all of the components required to run a DNA or RNA test. The kit is freeze-dried so that it can be shipped at room temperature. To use it you simply rehydrate the kit components, mix them and then combine them with your DNA or RNA samples before placing them in to the genesig q16 and starting the automated analysis. (DNA / RNA extraction solutions are supplied separately). Can I use the instrument with other kits or my own primers? The genesig q16 is a closed system that works specifically with the genesig Easy Kit range only. Is the genesig q16 compatible with the genesig Advanced and Standard Kits? No. The genesig q16 uses sophisticated algorithms for automatic data calling. These rely on data being received through the correct channels and controls falling within precise Cq windows. These are defined within the configuration of the genesig Easy Kits. Does the price of the genesig q16 include the software package? Yes. Instruments are shipped with software. There is no additional charge for software and it can be installed on as many computers as you like. From time-to-time software updates will be made available for free download too. What kind of reaction tubes/plasticware does the genesig q16 use and do I need to buy them separately? The genesig q16 uses low-profile 0.1ml thin-walled PCR tubes. Make sure you dont use alternative plasticware in the genesig q16 as it could damage your instrument. Every genesig Easy Kit comes with reaction tubes for the genesig q16 so you don't need to purchase these separately. How do things work if I have more than one genesig q16? You can connect multiple instruments to the same computer via a network switch or via a local area network. One copy of the software on one computer sufficient to analyse the data from multiple machines. Does the genesig q16 require validation/calibration upon arrival like some other qPCR machines? No the genesig q16 arrives ready to use. If you require calibration data or a routine calibration service for Quality Systems purposes please contact us. Does the genesig q16 have sound, light or display indicator that reaction is over and timer to show how much time is left until the end of the analysis? Yes! Voice commands are present at the beginning and end of each run. Coloured lights show the progression throughout the PCR cycles and the software displays a countdown to show how much time remains for analysis to complete. Can the genesig q16 run genotyping kits? Not at present, although this is planned for a future update. Can the genesig q16 run GMO detection kits? What is the warranty on the genesig q16 and can we purchase an extended warranty package? The genesig q16 is supplied with a 12 month warranty. Additional warranty can be purchased. Please visit this webpage to find out more. What happens if my genesig q16 needs repairing? We will ask you to return the instrument and we will provide another instrument for you to use in the meantime whilst repairs are underway. Can I replace parts with locally sourced components? Would this void the warranty? We would never recommend replacing parts on the genesig q16 yourself. Always contact us for any technical issues. Changing any parts yourself would void the warranty. What channels does the genesig q16 detect through? Every genesig Easy kit contains multiplexed green/yellow primer/probes for the target of interest and internal control. What is the reaction volume on the genesig q16? genesig q16 reaction tubes can hold up to 200ul, although genesig Easy Kit reactions are all 20ul in volume.